Whether its medical bills, car repairs, rent increase, or other unplanned expenses – Life sometimes gets in the way and you find yourself spending more than you have. There are times when you just don’t have a choice and you have to spend well beyond what you have just to keep going. So if you find yourself staring at those unbelievably high bills with ever higher interest charges then maybe it’s time to step back and take a look at your options to get rid of some of your accumulated debt. Before you start looking at debt relief options you need to understand what your current debt situation is and what your monthly cash flow looks like. If you don’t know some of this information you can use the creditor’s website or phone number to start this investigative process. Once you have the list it is a lot easier to assess what your most expensive debt is – which debt has the highest interest rate and cost, the highest fees and the highest payments and balances.
. Start by listing your monthly after tax cash Income followed by expenses. Expenses include housing (rent, utilities, phone), food (not eating out), transportation (car payment, insurance, gas, tolls, parking, maintenance), healthcare (medication, DR visits, insurance), and personal spending (eating out, going out, entertainment, gifts, clothing, vacation). The budget will often be an eye opening experience in helping you identify where you are spending your cash. It often leads to an evaluation of the ‘I need’ expenses versus the ‘I want’ expenses. Normally some short term changes in your spending can net you some additional cash to apply towards your outstanding debt. Essentially, focus on generally being a little more practical in everything you do. This process will free up some much needed cash and it also allows you to make a realistic plan on how to systematically reduce your debt. When you are ready to pay off your debt, target the debt with the highest annual interest rates, the highest fees, or the highest balance. Focus on one debt at a time and determine how long it will take to pay off each debt. Modestly celebrate your victory. 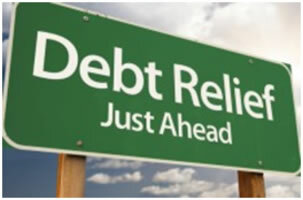 Working with a debt relief professional. Professional assistance may be your best option if you are unsuccessful trying to manage your debt or your debt situation is at a point that you cannot get out from under the debt without assistance. At a minimum most professionals will need your financial information to determine if they can help you. That info would include what you gathered on your debt info and your budget to determine your financial situation. Typically, they will go through that data and help you evaluate what your options are. The best professionals offer the first hour discussion as a free consultation and don’t charge upfront fees. Look for professionals that will allow you the freedom to walk away at any time without additional fees. It is common for professionals to specialize in a particular area of debt reduction although there are professionals that offer many different services. Be sure to shop around and talk to more than one before making a selection. Certified Credit Counseling. If you are having difficulty understanding how to solve your current debt situation, your monthly cash flow is negative, or you’re not sure how to create a budget that will allow you to get out of debt, you may want to consider working with a certified credit counselor. This may also be a good option if you need help sticking to a budget and feel an outside party can help you stay on track. There are many credit counseling organizations to choose from. A few are truly free, some are kind of free, others require you to pay fees throughout the process. Your local bank, credit union, or church may offer free or small fee seminars / training on how to get a handle on budgeting, spending, and saving. Credit counselors offer advice on how to handle your debt and can help you develop a budget and a personalized plan to get out of debt. Credit counselors may offer debt management plans as one of their services. A Debt Management Plan involves the credit counselor negotiating payment plans with your creditors, collecting monthly payments from you, and using those payments to pay your creditors. The counselor may be able to get lower monthly payments or get fees waived but they will not negotiate to lower your debt. The Debt Management Plan can take quite a while to eventually get your debt taken care of. If you are offered this service make sure to ask a lot of questions to ensure you have a reputable company working to your advantage. The FTC has a good list of questions for you to consider asking. (this will link to http://www.consumer.ftc.gov/articles/0153-choosing-credit-counselor). Debt Consolidation. Debt Consolidation is a method of lowering your overall credit cost by consolidating many or all of your loans under a single loan with better terms, usually involving lower interest rates, a lower monthly payment amount, a shorter length of payment term, or lower fees. It is a viable option if your credit status is good enough to borrow money from another lender at a lower rate of interest thus reducing your overall cost. It also simplifies your debts obligations, reduces the communication nightmare of multiple lenders and often allows for a faster repayment of your debt. If you have at least 25% equity in your home you may be able to use it to get a short term home equity line of credit or loan to pay down your high interest debt. Keep in mind that you are putting your home equity up as collateral for this loan and rates can go up while you are borrowing the money. Not all banks will be open to home equity loans or may not offer good interest rates – be sure to shop around. An additional advantage is that your home equity loan interest expense may provide certain tax advantages. The disadvantages of using debt consolidation is that it usually results in negative points on your credit history and the lenders are less forgiving when a payment is late, imposing steep late payment fees. However, there can be tax advantages of using debt consolidation. Your debt can be reduced substantially, unlike credit counseling or debt consolidation where you are expected to pay back the full amount. The process takes time, months not weeks, perhaps as long as 24 months. Don’t expect immediate results and stay committed to get a favorable result. Creditors have a process and often dedicated people for dealing with collecting debt and minimizing the creditor’s losses. They will be working against you with negotiating tactics to collect more and motivate you to pay. If you plan on going it alone prepare yourself for some interesting (stressful) phone calls, emails, and letters in the mail. Working with a professional will alleviate some of the stress and put an experienced negotiator in your corner that is well aware of the industry’s process and can get you better results. Common debt settlement tactics may include not paying your bill for months, thus reducing your credit rating and access to additional credit during and after the process. Securing a settlement requires that you pay the creditor some of what you owe in a lump sum payment. Each creditor will have a Debt Settlement Letter drawn up identifying the amount the debt can be settled for and the date(s) the settlement payment is due. Bankruptcy. The prospect of wiping the slate clean of all your debt sounds encouraging but there are substantial long term drawbacks to using the bankruptcy process to do so. Exploring the bankruptcy option should be done with a certified professional bankruptcy service provider. Filing bankruptcy is usually the last course of action as it could cause substantially more damage to your credit status and affect your ability to get credit for a long period of time. A Chapter 7 bankruptcy filing remains on your credit report for 10 years from the date of filing. A Chapter 13 bankruptcy filing remains on your credit report for seven years from the date of filing. Creditors may view you as an unwanted credit risk with a previous bankruptcy on your credit history. If you feel that you need professional assistance we would be pleased if you would add us to your list of companies to consider working with. Our debt relief advisors will provide a free consultation to help you identify the best debt relief option for your situation. PCS Debt Relief is not a law firm, and does not provide legal counseling. If PCS believes bankruptcy may be the best solution for you after analyzing your situation, your debt analyst will refer you to an attorney to receive legal counseling.